This dragon fruit smoothie is delicious and refreshing. This exotic fruit is delightful to make a smoothie with. Also, this recipe is vegan and gluten-free. It is a tasty smoothie which is great for breakfast or an afternoon snack. Dragon fruit is antioxidant-rich and this recipe has only healthy ingredients. 1. First, take the dragon fruit out of the skin, then cut it up into small chunks. 2. Cut the pear into small pieces. 3. Put the dragon fruit, pear, blueberries, yogurt, stevia and chia seeds into a blender. 4. Add milk and blend on high until smooth. 5. Pause to scrape the sides of the container with a spatula as needed. 6. Pour smoothie into a glass and top with additional chia seeds and berries if desired. This dragon fruit smoothie recipe will make 4 glasses. If the smoothie is too thick, add 1/4 cup milk and re-blend. If the smoothie is too thin, add 1/4 cup more berries and re-blend. A dragon fruit smoothie is Nutrient Dense: It is full of good fiber and high in vitamin C and B vitamins. Also, has the minerals magnesium, calcium, phosphorus, and iron in the fruit. 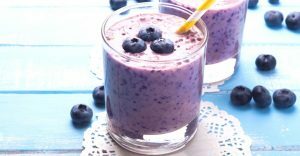 Sweet Wild Blueberry Keto Smoothie is Easy to Make -I love this wild blueberry keto smoothie. It is perfect for a quick breakfast or makes a tasty afternoon snack. What makes it keto is that there are only a small amount of blueberries in it and all of the other ingredients are keto friendly. I make it a little sweeter by adding a few drops of stevia to mine. Yummy Mandarin Orange Green Smoothie is Easy to Make – This mandarin orange green smoothie super easy to make with only three main ingredients. There’s not much shopping to do. I love a green smoothie for breakfast. Try one yourself. Pineapple, Banana Turmeric Smoothie – This is a delicious smoothie that is extra healthy with the turmeric and chia seeds for you. A great breakfast!